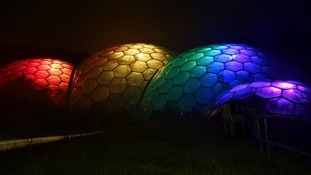 The Eden Project's rainforest biome has been lit up in rainbow colours in preparation for the project's first-ever LGBTQ event. Proud Eden features two stages and includes artists celebrating LGBTQ (Lesbian, Gay, Bisexual, Trans and Queer) culture. The biome will again be lit with rainbow colours for the finale of the event tonight. Publisher Penguin Random House and Gay Times will be curating the action on the Main Stage in the Mediterranean biome. Matthew Todd, former editor of Attitude magazine and poet Dean Atta will give talks. On the Dome Tent Stage will be music, dancing and art. A full schedule and details is available on the Eden Project website.